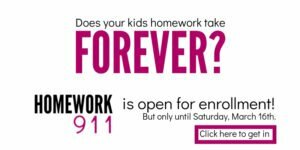 I am always looking for fun and affordable ways to spend time together as a family in Phoenix. While the sky train is one of our favorites, I also want my children to experience nature, become more curious about their city and explore the wonders of the outdoors. Time to go geocaching with kids! If you are new to geocaching, this article will explain how to get started and what to do when you find your first cache. Perhaps you are like me and you’ve heard of geocaching but not quite sure how it works. Let me tell you, how exciting! You have just discovered a way to entertain yourself and your kids in a moment’s notice and pave the way for a spontaneous adventure. Geocaching is an entire community. Think of it as the largest hide and seek game in the entire world. People hide little treasures all over the city. Seriously, everywhere. There might already be geocaches in your neighborhood, perhaps the park down the street or in the city you are vacationing in! Each cache contains something different. Perhaps its simply a sheet a paper to sign your name on or it might be another little trinket or treasure that you can take with you. The fun is searching for the cache and then being surprised at what magic you find. Visit the Geocaching website and sign up for a free account. With a free account you can access some caches but not all. Once you sign up for an account, download the Geocaching app onto your phone. It’s available for an Apple device or Android. Finding a cache is as easy as starting the app, pulling up the map within it and heading out to find your treasure. I upgraded to a premium account because once I pulled up the map, I knew I wanted more options than the limited caches shown to me. You have the option of either paying $5 a month or $25 per year for the premium membership. There is also an option to pay for the full featured app for $9.99 (Apple or Android) . However, I found that the free version works perfectly well. What’s a cache? In short, a treasure. Before you begin, make sure you have a pen. Within each cache is a log that you can sign and date. Select the cache you wish to find on the app and press start to navigate towards it. The app will use your phones GPS to tell you how far away you are and which direction you need to go. Once you are within 30 feet, the app chimes. At this time, I recommend pulling up satellite mode on your phone so that you can view bushes and terrain. 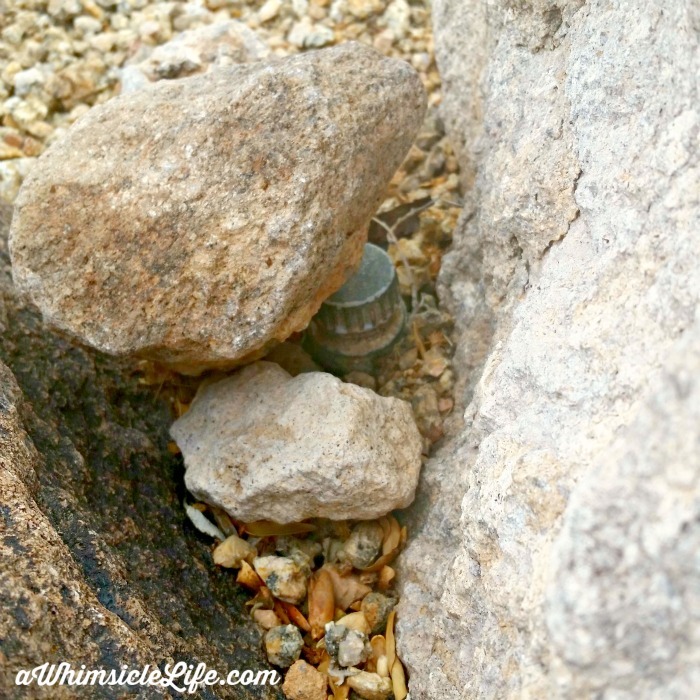 These caches are small and can sometimes be very tricky to discover. Get on your hands and knees and start searching on the ground or within the crevices of trees nearby. A cache will never be buried, but it might be covered with a rock or two. I like to look for anything that looks unnatural in the environment. For instance, if you are geocaching while hiking and you spy a pile of rocks that nature could never pile up in that way, you may be looking at the hiding spot for a cache. Don’t be tempted to give up or think it was moved. If you have doubts, check the log portion of the app to see when it was last found. You can also scroll through to look for pictures or hints. Bear in mind though, no one will give up the cache’s exact location. That would ruin the fun. Carefully remove anything covering the cache and take note of how its arranged. You’ll need to place it back once you write in the log book. There are so many different types of caches. All are noted on the app when you start looking for them. Most are “traditional” which include at least a logbook. Some have fun surprises inside. Others are part of a series. My family and I hiked in Usery Regional Park for our first geocaching adventure. The park has set up a series of caches that start along one of the trails within. Our first find was a little tricky. I got on my hands and knees to look under rocks and brush. And then, victory! As you see, it looks like an irrigation spout, but this a regional park. It doesn’t have a sprinkler system. We took it out and signed our names to the log. Then placed it back along with its original covering. 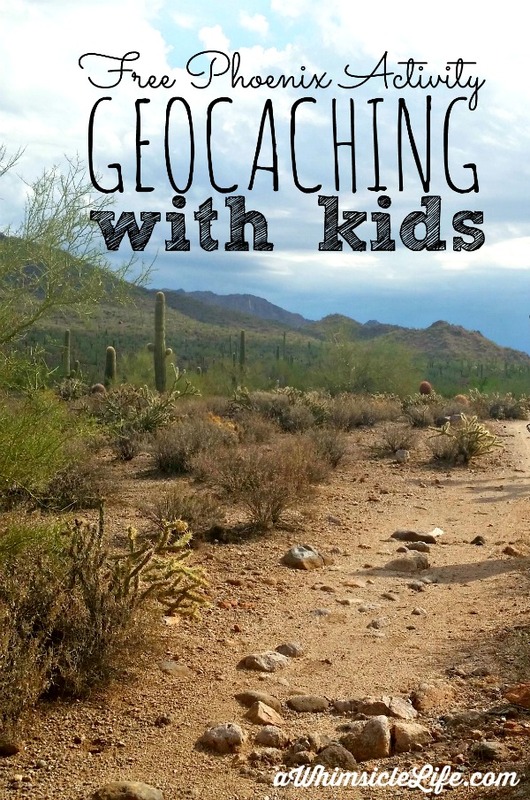 Geocaching is an amazing way to get kids outdoors and curious about the world around them. The activity is also a great way to discover new places in your city and connect with others. 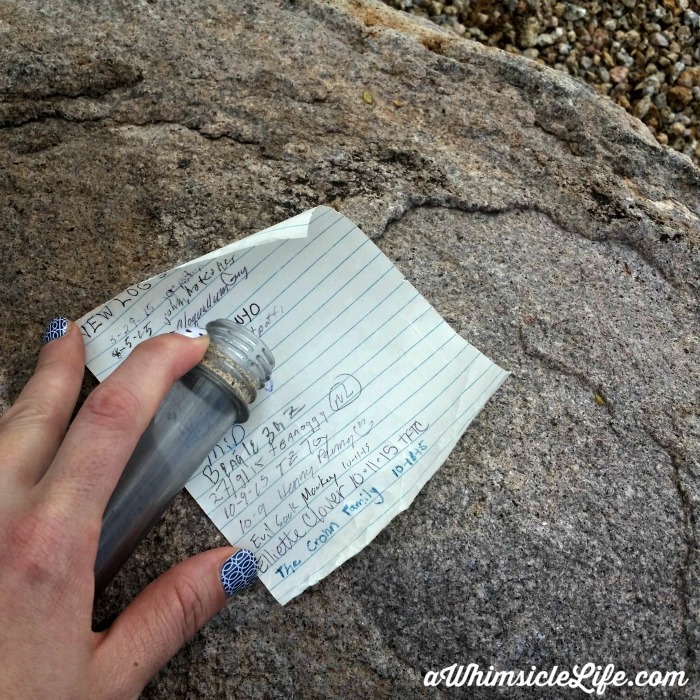 Have you tried Geocaching before? Are you going to now? I’m so glad you explained this in detail. I’ve seriously wanted to do this for years, but I never got around to doing it. Now I feel comfortable enough to lead my kids on an adventure.